Pittsburgh Penguins captain Sidney Crosby joined Mario Lemieux and Bernie Parent as the only other players in NHL history to win the Conn Smythe Trophy in back-to-back years. Crosby deserved it, posting eight goals and 27 points in 24 playoff games. But he wasn’t the only member of the Penguins who played at an MVP level. Both goaltender Marc-Andre Fleury and Matt Murray were sensational this postseason. It’s likely no media member voted for either, though, because the two goaltenders split the workload. 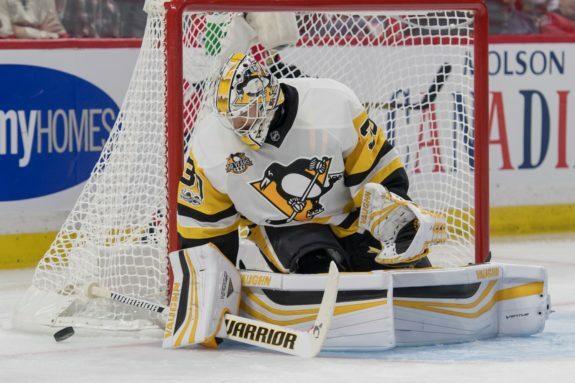 The 32-year-old veteran took over for the injured Murray just before their first playoff game versus the Columbus Blue Jackets. Fleury was in top form, recording a .933 save percentage in the first round. He went on to play very well in three of the first four games against the Washington Capitals. At that point, the Penguins nearly collapsed, but Fleury saved the day in Game 7 with a shutout. Washington outshot Pittsburgh in every game, and opponents outshot the Penguins in every contest but one through the first two rounds, yet Pittsburgh was back in the Eastern Conference Final in large part because of Fleury. He went on to record another shutout before yielding the net to Murray after a poor performance against the Ottawa Senators. But at that point, Fleury was Pittsburgh’s top Conn Smythe choice. He finished the playoffs 9-6 with a .924 save percentage, 2.56 GAA and two shutouts. 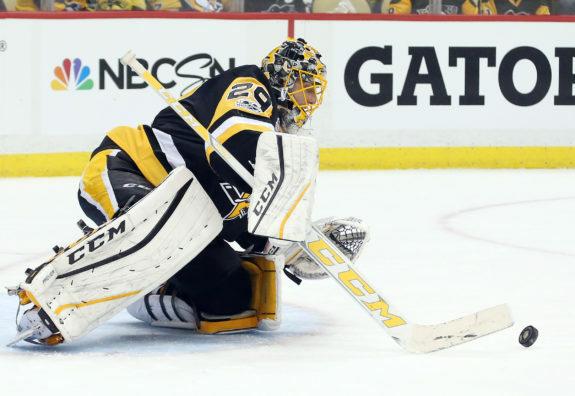 Once coach Mike Sullivan announced Murray as the starter for Game 4 of the Eastern Conference Final, it was hard to imagine him performing even better than Fleury. But he arguably did. Murray entered Game 3 against the Senators and went on to register a .946 save percentage in his next five games. The 23-year-old won five of his first six starts until he ran into the raucous crowd in Nashville. But to end the Stanley Cup Final, Murray posted back-to-back shutouts, giving him three in 10 postseason starts this spring. He stopped the final 64 shots he faced in the series. The three shutouts helped Murray finish the playoffs with ridiculous numbers including a 7-3 record, .937 save percentage and 1.70 GAA. But no one considered him for MVP because he missed the first 14 games. Two players have never shared the Conn Smythe award, so it would have been unprecedented to vote for both goaltenders together. Actually, it’s not even permitted. Originally, Dave Molinari of the Pittsburgh Post-Gazette reported two players that play the same position cannot share the Conn Smythe. He clarified those remarks. Clarifying an earlier tweet: Players from the same on-ice position can share the Conn Smythe, but two players can't share same ballot space. So the only way two players can share the award is if they finish with the same amount of votes. While sharing the trophy shouldn’t become the new normal, goaltending is what drove Pittsburgh to its second straight championship. 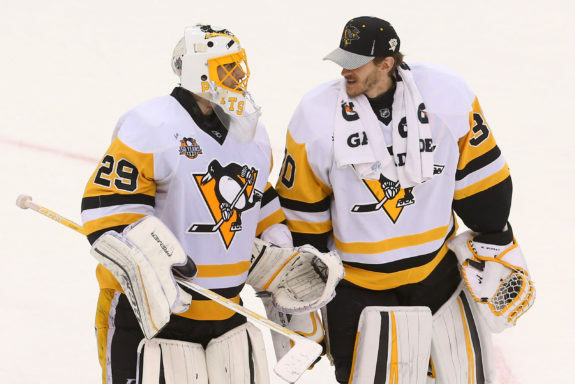 Together, the Penguins’ two netminders were 16-9 with a .929 save percentage and 2.19 GAA. As great as Crosby was, it’s why Pittsburgh won the Cup. It makes sense media members can’t vote for Crosby and Malkin together because then seemingly every Conn Smythe could be split. Goaltending is different, though, as they aren’t playing together. Whether it’s by choice or because of injury, if two netminders share the net in the postseason and goaltending is the reason that team wins the Cup, why not be allowed to vote for both? No disrespect to Crosby, as he was exceptional. But the most fitting choice for the Conn Smythe would have been to share it for the first time in history between Fleury and Murray.